It may have seemed a good moment while public attention was focused on the approaching second anniversary of the Maidan killings to effectively kill another no less important investigation. 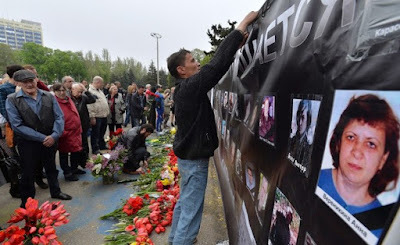 Any moment, however, is bad given the scars left by the deadly disturbances and fire in Odesa on May 2, 2014, Kremlin-sponsored propaganda lies and, not least, the likely involvement of at least some high-ranking police and emergency services officials in the tragedy. The Prosecutor General’s Office has now handed all criminal investigations over the Odesa events to the investigative department of the Odesa regional police. In so doing, it has ignored last year’s damning Nov 4 report from the Council of Europe’s International Advisory Panel which pointed to the clear conflict of interests in the Interior Ministry investigating evidence of police complicity and omissions. It has shown just as little regard for the legitimate call from the nongovernmental investigative 2 May Group for the entire investigation to be handed over to the Department for Special Investigations, which is at least in theory an independent body within the Prosecutor General’s Office. Six people died of gunshot wounds and hundreds were injured during disturbances in the centre of Odesa after pro-Russian and anti-Maidan activists attacked a pro-Ukrainian unity march. The first two people killed were Euromaidan supporters. News of the first death – that of Euromaidan activist Ihor Ivanov – spread swiftly and was instrumental in the violent and chaotic turn the disturbances took. More weapons began being brought to the scene, and the other four deaths, almost 2 hours later, were of anti-Maidan activists. A further 42 people – all anti-Maidan activists — died as a result of a fire in the Trade Union building on Kulikovo Pole. There have been efforts from the outset to claim that the fire was deliberately caused by pro-Ukrainian activists and therefore a ‘massacre’. In fact, however, both the 2 May Group and the International Advisory Panel [IAP] concluded that there was no way of determining whether Molotov cocktails thrown into the building (by pro-Ukrainian activists) or out of the building by the anti-Maidan activists caused the fire. The emergency services took 40 minutes to appear and it was this that caused the massive loss of life. Volodymyr Sarkisyan from the 2 May Group writes that despite the promises from Interior Minister Arsen Avakov to call in international specialists, it became clear very early on that high-ranking people in the Interior Ministry and in the Prosecutor General’s Office [PGO] had no interest in carrying out a proper investigation. The investigative activities were divided up with the PGO responsible for probing the activities of the police, while all other actions, including the failure of the emergency services to respond, were left to the police. This created an artificial divide and “destroyed the single logical link between the people involved in the events”. The International Advisory Panel pointed specifically to the fact that the emergency services are subordinate to the Interior Ministry, meaning that the latter cannot possibly be considered a disinterested party. The Panel strongly advised that the investigation be carried out by an independent body and not the Interior Ministry. Not only have such findings been disregarded, but now the entire investigation has been handed over to the Odesa regional police, a body overseen by the Interior Ministry. Avakov had earlier also reduced the main investigative body to only 3 officers. The latest moves coincide with new attempts to push the ‘massacre narrative’, including through a film by Paul Moreira called ‘Masks of the Revolution’ shown on France’s Canal +. The film has been strongly criticized by French journalists, including many who are working in Ukraine. This has remained unheeded by Canal + which is continuing to broadcast the film without providing any counterweight to gross inaccuracies regarding the events in Odesa, Euromaidan and over Russia’s annexation of Crimea. Whatever Moreira’s motives were, the film, and its misleading presentation of the events in Odesa, are being actively exploited for a new Russian propaganda drive. One of the leitmotifs of the film and those pushing it is that only a few courageous individuals are fighting a conspiracy to conceal an alleged ‘massacre’ by US-sponsored far-right radicals. These are outright lies, but efforts by the 2 May Group and others to refute them are hardly assisted by high-ranking law enforcement officers in Ukraine trying to protect their own by sabotaging the investigation. Most of the anti-Maidan activists on trial are facing vague charges that could be laid against a huge number of other people that day. Only one of the people currently facing charges – Serhiy Khodiyak, a Maidan activist — is accused of using firearms, though it is questionable whether his involvement in any of the killings can be proven. Petro Lutsiuk, the head of the regional police at the time, was placed under house arrest on May 13, 2015, and charged with professional negligence and leaving people in danger with serious consequences. This specifically concerned the fact that the action plan which had been drawn up in the face of anticipated disturbances and agreed to was not registered and therefore never came into force. He has since been released and members of the 2 May Group are sceptical about the case turning into a real prosecution. Volodymyr Bodelan, the then head of the Odesa Emergency Services. has admitted that he was personally responsible for delaying the fire brigade for 40 minutes. He finished his contract as planned, then stood for election to parliament. He disappeared for a few months after Lutsiuk was arrested, and liberally gave interviews to the Russian media full of misleading information and minimizing his role in the events. He recently returned, and obviously has his reasons for believing himself to be safe from prosecution.